Ladies’ Street Costume, Summer 1893, from Authentic Victorian Fashion Patterns. 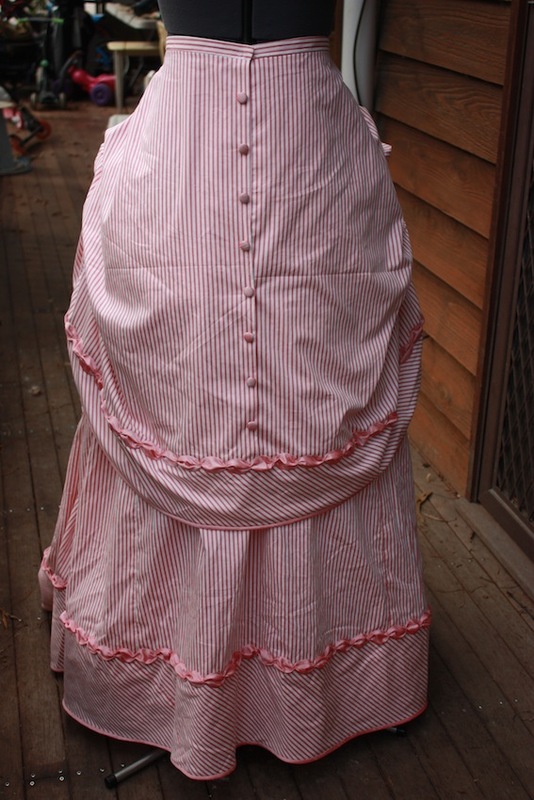 Quite a while ago I made a Victorian Fan Skirt, which I generally wear dancing with just a T-shirt. However, I began to feel that it would be nice to make a matching jacket using the left over material. It could then be used as more of a complete costume, instead of just a dancing skirt. I did not have very much material left, so I thought a bolero jacket would be the easiest option, as it used the least fabric. Bolero jackets had been quite popular since the 1850’s and 60’s, and continued to be so through to early Edwardian times. They differ from the warm winter jacket and coats, that clearly were designed for warmth. Instead they seem to be more of a decorative fashion. 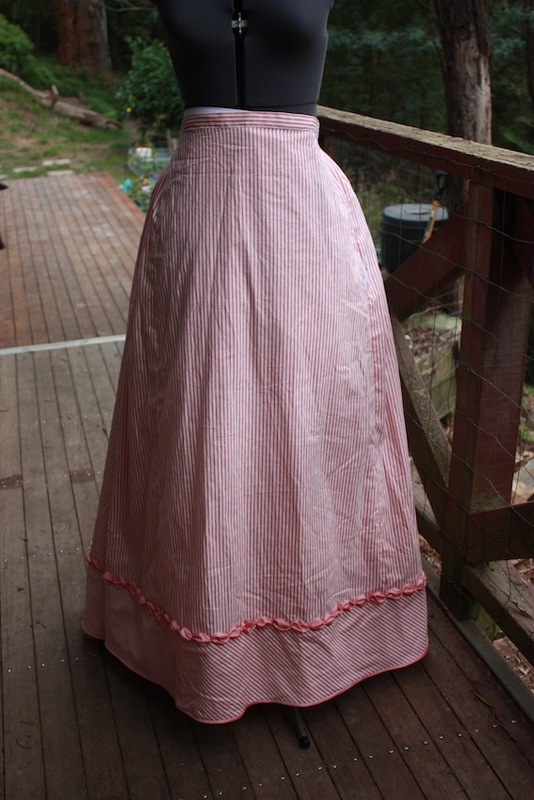 I used a pattern from Authentic Victorian Fashion Patterns, edited by Kristina Harris. This pattern book is a reproduction of patterns that were published in the popular dressmaker’s journal, The Voice of Fashion. 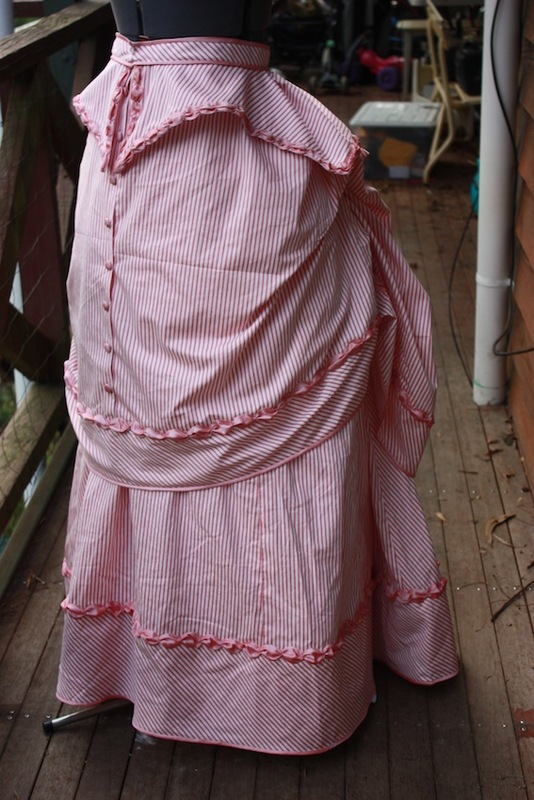 The patterns are all authentic 1890’s patterns and cover a wide range of women’s clothing. I graded the original pattern up and then made the necessary adjustments according to my measurements. The original pattern is drafted onto grid paper and then cut out enlarged to fit my measurements. This jacket was made from the same materials as my Victorian Fan Skirt, with blue cotton outer and white cotton broadcloth lining. The construction of this bolero jacket was very simple, as there was no sleeves, no collar and no fastenings. It was also fairly simple to fit without doing a mock-up. Step One: I began by sewing the side seams together in the outer fabric. 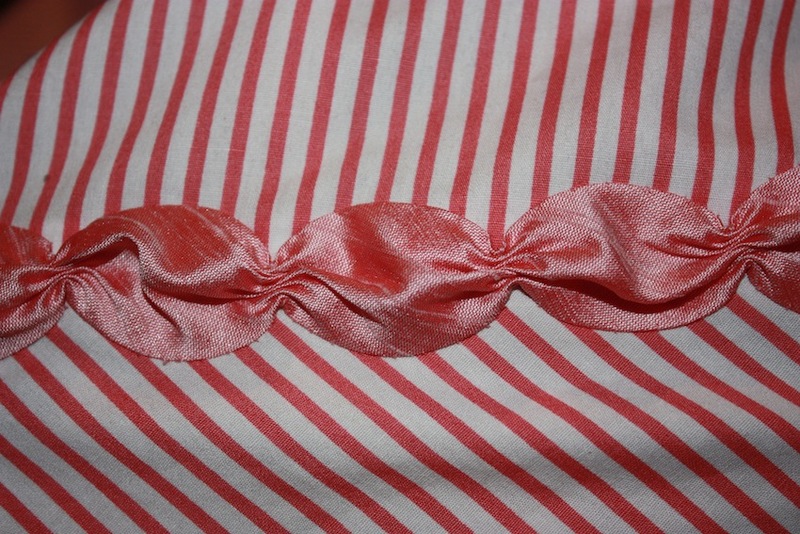 Then I sewed the side seams of the lining together. Step Two: Then the outer and the lining were placed right sides together and sewn around the outer edges. In the picture below you can see that the only part left unsewn is the shoulder seams. The side seams have been sewn and now the outer is attached to the lining. The curves are clipped and then the jacket is turned the right way and pressed well. Step Three: The shoulder seams can now be sewn. The outer layer is sewn first with the sewing machine, and then the raw edges of the lining are folded in and handsewn down. Step Four: Embroidery is one embellishment that I love to do on my clothes, and this jacket was no exception. I drew a design on the edges and embroidered it with one strand of white DMC cotton in chain stitch. The embroidery, which is a more mid-19th-century design. And here is the finished garment! Stay tuned for the next post on making a shirtwaist blouse to complete this ensemble! 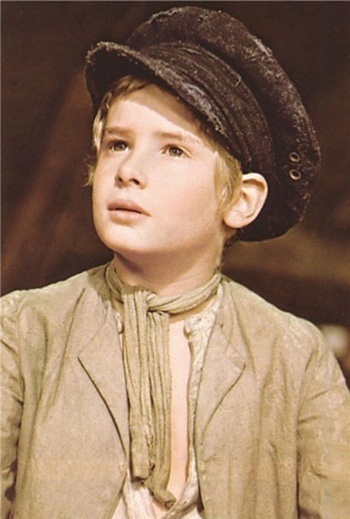 Mark Lester as Oliver Twist in the movie, “Oliver!”, in 1968. 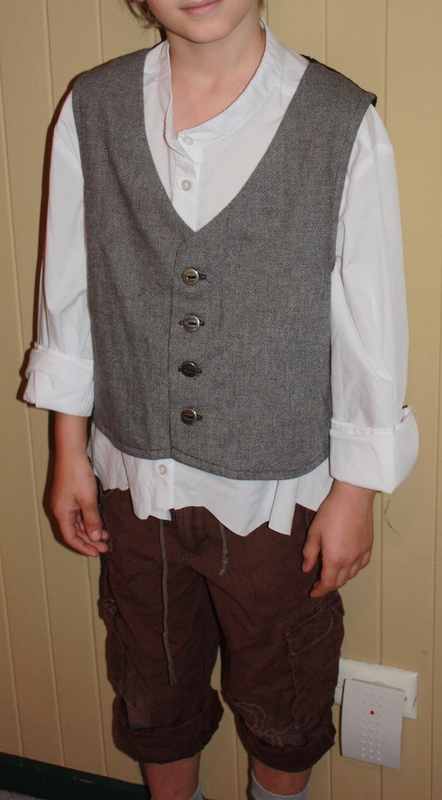 One of my sons was in a recent production of Oliver at school, and I decided to make him a quick costume for it. Optional extras include braces, jacket, black shoes, a scarf/cravat … and dirt! I bought a normal white button-up business shirt from a second-hand shop and unpicked the collar, that is, the “pointy” part. 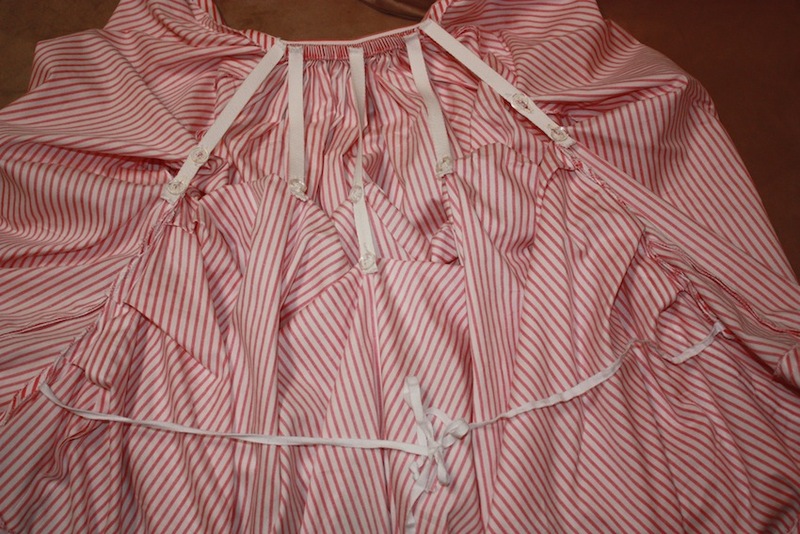 The shirt with the pointy strip of the collar removed. Then I sewed the neckband back together, making sure all the raw edges were tucked under. The shirt ended up being quite long, as it was a small adult size, so I roughly cut around the bottom edge so it didn’t look too ridiculous! I decided not to worry too much about making pants, so he just wore a brown pair of cargo drill pants that we already had at home, with the legs rolled up to his calves. Many boys in the Victorian period had matching pant/vest/jacket suits, so making something from the same material as the vest is always an option. 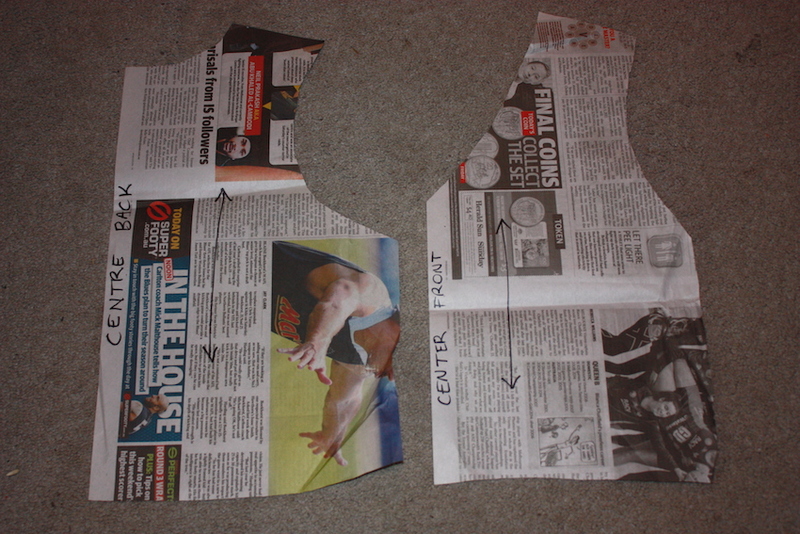 For the vest, I used newspaper for the pattern pieces and held it up to my son’s body and cut it out. There were two pieces, a back panel (to be cut with the centre back on a fold) and a front panel (with extra at the centre front for the button placket). Just remember that the centre front and the centre back need to be placed on the grainline. Grainlines generally run at right angles to the waistline. The newspaper pattern I drafted. I have marked the centre front and back. This is a useful video tutorial on how to make a very simple vest. You can easily make adjustments to it to suit a different style of vest. 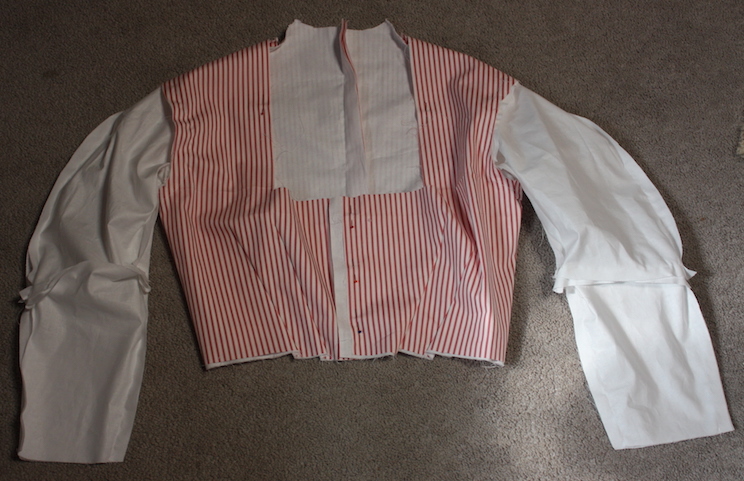 The vest front, shown with the shirt and pants. I had bought a large man’s button-up shirt from a second-hand shop, made from a heavy, thick woven cotton. I used this to make the both the vest and the cap. The vest is not lined, but is backed with black bemsilk. After unsuccessfully scouring second-hand shops for something suitable, I resigned myself to having to sew a cap. I used the free pattern and tutorial provided on Clevergirl, and set to work. 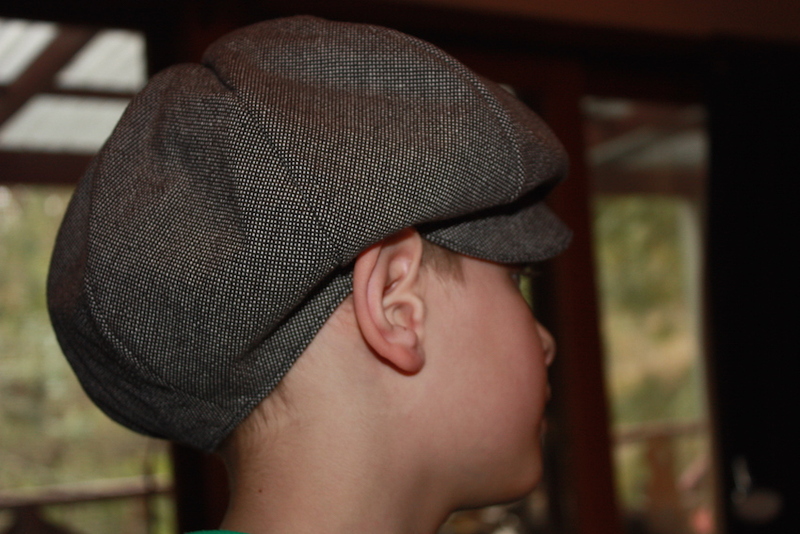 This cap was made from the same heavy cotton material I used for the vest, and was lined with black bemsilk. This cap is probably a tiny bit floppy for the purpose, but it can easily be adapted if you prefer the panels to be smaller. The good thing about this type of costume is that it can be used for a number of characters, including Gilbert Blyth (Anne of Green Gables). I am always on the look out for easy, versatile book-character costumes to use for Book Week! 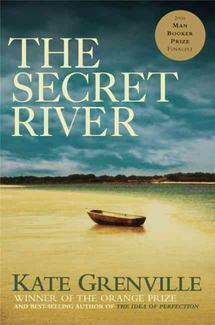 The Secret River is a novel by Australian author, Kate Grenville. It explores the experiences of early convict settlement in Australia when fictional character, Will Thornhill, is transported from England 1806 and then pardoned to live as a free settler in New South Wales. The story focuses much of the plot on William; first his early life, his transportation as a convict, and then the process and difficulties of becoming a landholder. His wife, Sal Thornhill, also travels to Australia with him and, together with their growing family, they eventually settle along the Hawkesbury River in what is now Sydney. This novel explores the very natural conflict that occurred between white settlers and the native Aboriginals, as both groups fought for ownership over the land. The plot also contrasts the attitudes of those white settlers who had begun to realise that these native people were essentially the same as them – they loved their children, they loved their home -, with those who believed the natives were little more than animals. Late last year I was contacted by a dancing friend of mine who was looking to gather together a group of “youngish” period dancers to dance in a scene of an up-and-coming movie-mini-series by the ABC, The Secret River. I was so excited to participate, as it was the first time I had been an extra in a movie, but the fact that is was a PERIOD movie really tickled me! I am pleased to announce that the two-part mini-series premieres on Australian television on ABC, on June 14th and 21st, 2015. I will be watching to see if my scene made it into the final edit! This book has also been adapted for the stage by Andrew Bovell, and was dramatised for audiences by the Sydney Theatre Company in 2013. The drawing in Janet Arnold’s “Pattern of Fashion 2”. 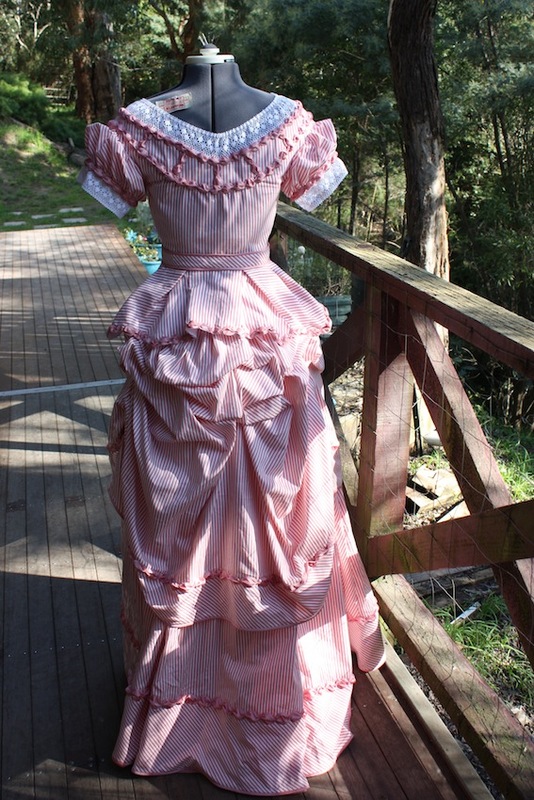 In the first part of this series, I concentrated on making the skirts of this early-1870’s gown. The skirts have such a nice drapery about them! For this post I will be looking at the construction of the ballgown bodice. Ballgown bodices of this era often had short sleeves or were occasionally sleeveless. They were quite decorated around the bust and sleeve area, and often appeared to be almost off-the-shoulder. The pattern I am using is from Janet Arnold’s Patterns of Fashion 2. 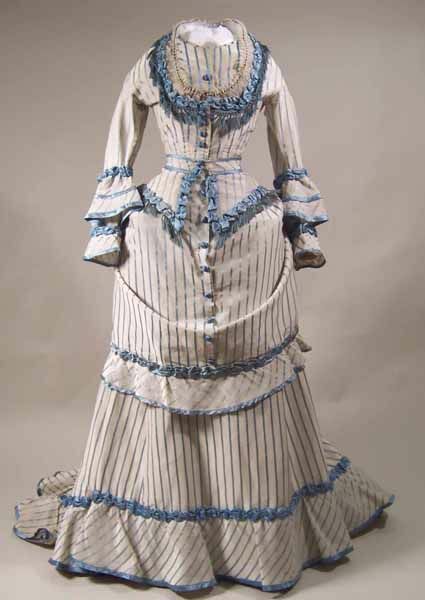 This particular gown has three separate skirts (the underskirt, the overskirt and the basque), as well as two bodices (the evening bodice and the day bodice). 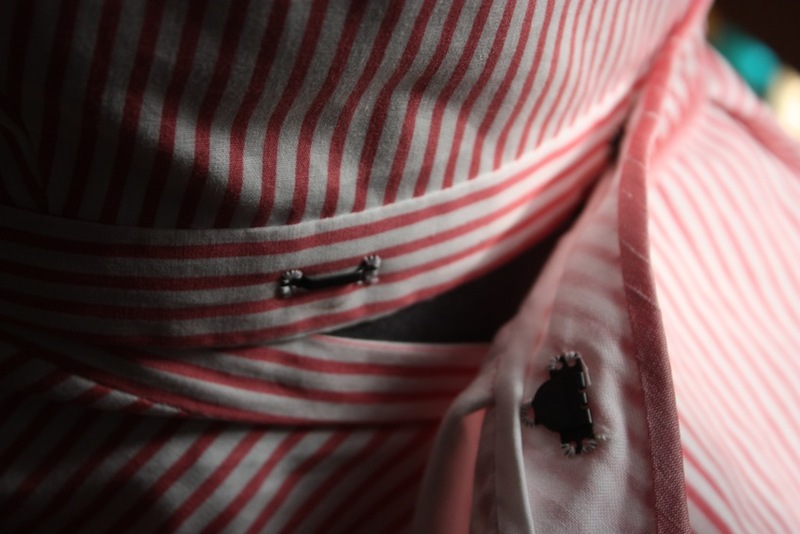 This garment was made from a printed striped cotton fabric and the lining was a white cotton broadcloth. The trims on the garment are made from a polyester shot maverick shantung. I made a mock-up of the bodice first, just to sort out any fitting issues. I had to adjust the bertha quite significantly to fit it properly, and the waistline had to be enlarged. Step One: Once the pattern pieces were cut out, I mounted the outer fabric of the bodice pieces onto their corresponding lining pieces and treated them as one. Step Two: I sewed the bodice side seams, then the front darts to fit. I sewed the shoulder seams. The darts and side seams all sewn. The shoulder seams are yet to be sewn. Step Three: The bertha has an outer layer (cotton), lining layer (cotton) and inner layer of stiff net. There are four bertha pieces (front left and right, and back left and right), so altogether you should have cut out 12 pieces (four bertha pieces each in outer, lining and net). Note: In the pattern the bertha pieces are all the same shape (for both front and back) but I had to adjust this in order for the garment to fit properly. My front and back bertha pieces, therefore, are different shapes. I sewed each of these four bertha pieces to their corresponding layers (outer, net, lining layers) together on the upper edge. The bertha (front left piece) sewn to all its layers (outer, net, lining) along the upper edge. It is now opened up and pinned to the front right piece along the centre front. You should now have four bertha pieces that are all attached along the upper edge. Now they need to be attached in the centre front and centre back. 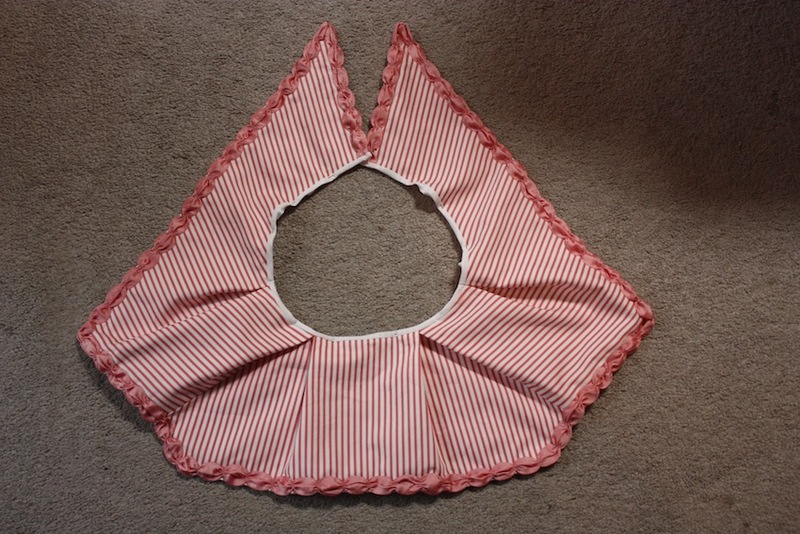 Do this by opening the pieces out and pinning right sides together at the centre front/back and sew. The bertha is sewn at centre front (and likewise at centre back, not shown). Clip seam allowances and turn right side out and press. The front and back bertha pieces are now sewn at the shoulder seams. Step Four: The bertha can now be attached to the bodice. Match centre fronts and backs and shoulder seams. Sew the bertha outer layer (including the net) to the upper edge of the bodice (right sides together). Press the seam towards the bertha and turn the raw edge of the bertha lining under. Slip stitch it down. The bertha is attached. The bertha lining is being turned under and hand sewn down. Step Five: Sew the sleeve seam. 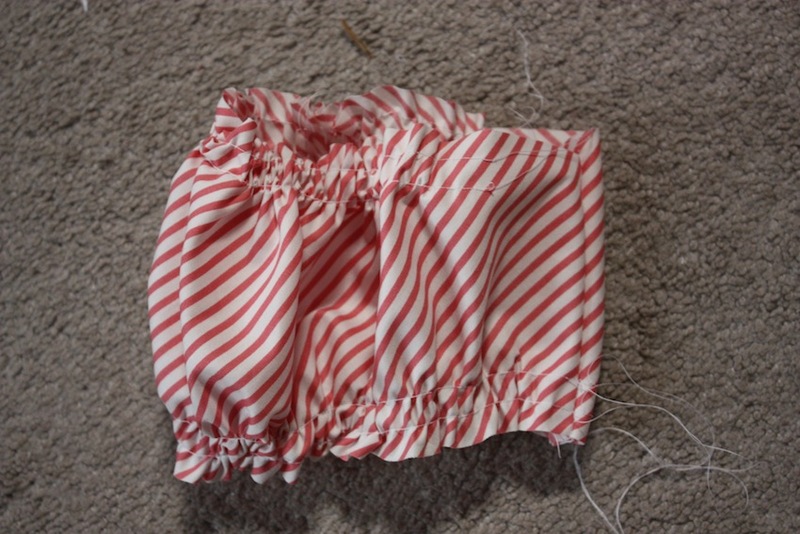 Gather the top and bottom edge of the sleeves (outer). The sleeves are gathered top and bottom. For the sleeve lining, slash the mark and insert the gusset. Sew the sleeve seam. 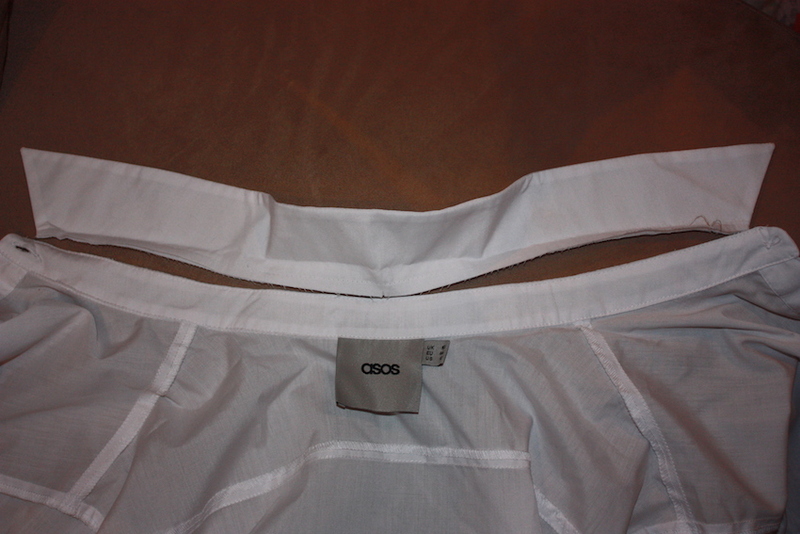 The lining sewn, showing the slash with gusset inserted. Mount the sleeve outer on top of the sleeve lining (wrong sides together) and pin. Attach the sleeve band, turning the excess to the inside and slip stitching the raw edges under. The sleeve mounted on the lining and sleeve band attached. The raw edges of the sleeve band are pinned under and are ready to hand sew. The sleeves can then be attached to the bodice. Step Six: Attach the waistband to the bottom edge of the bodice. Step Seven: Attach lace around the bottom of the sleeves and around the neckline. 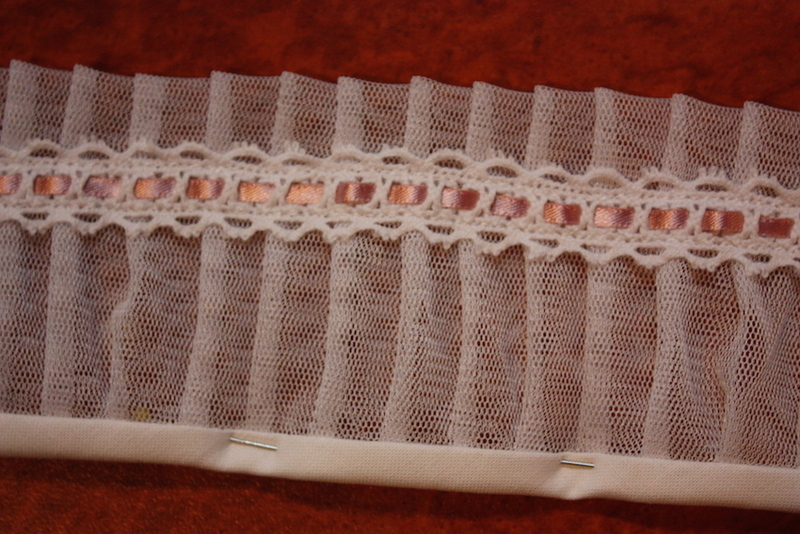 I used a 2 inch wide insertion lace. A thin cotton cord can be used to draw the fullness of the lace in so that the bodice does not fall down over the shoulders. 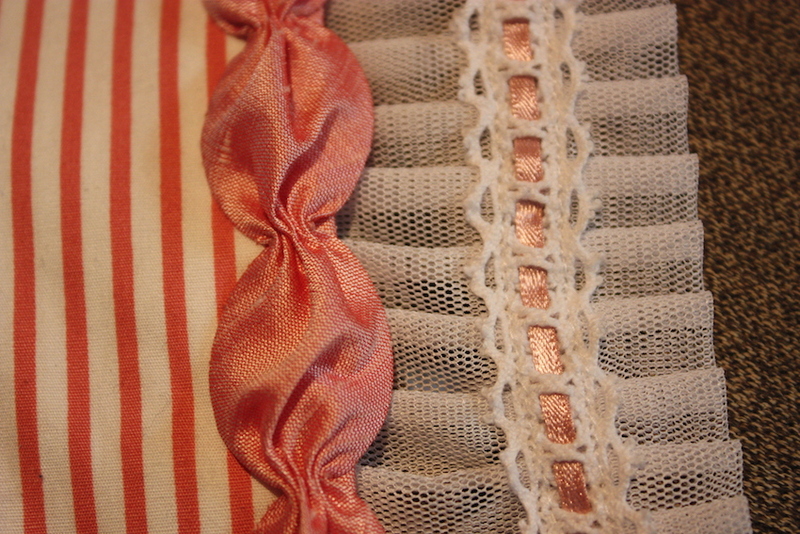 The front of the bodice, showing the cord lacing up the insertion lace at the front. The trim is also sewn down. Step Eight: Make the trim (the same as is detailed in “the skirts” post) and attach it around the sleeve cuff, and around the bertha as per the diagram in Janet Arnold’s book. 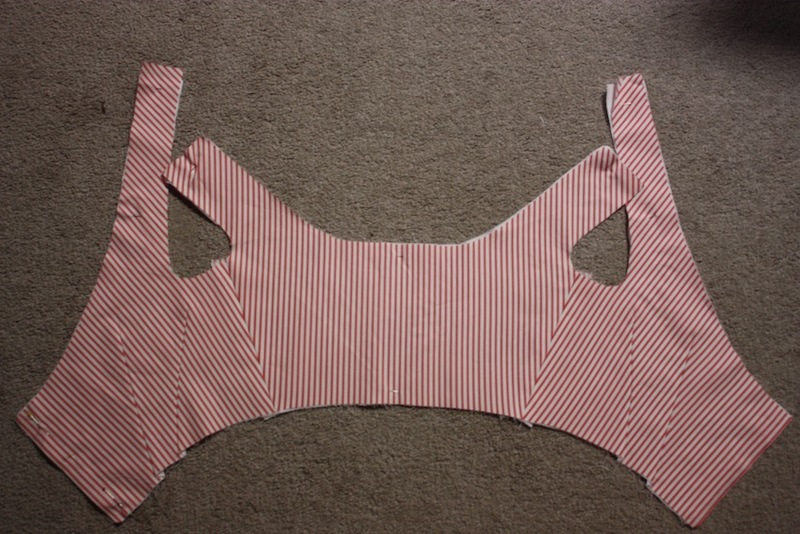 Step Nine: Attach hooks and eyes down the centre front of the bodice. The centre front of the bertha meets edge to edge with the trim hiding the hooks and eyes, but further down on the bodice I created an overlap to more effectively hide the hooks and eyes. The hooks and eyes sewn to fasten at the front. They are tucked behind a slight overlap in the fabric. Three waistband/trouser bars were also sewn to the back of the bodice waistband to correspond to matching hooks on the basque. The back of the bodice, showing the hooks and bars sewn to attach the basque. All finished! My dressmakers form is not the same shape as my corseted body but hopefully you get the idea. My last post in this series will be about making the day bodice for this ensemble. For more information on my costuming, go to my Costumes page. 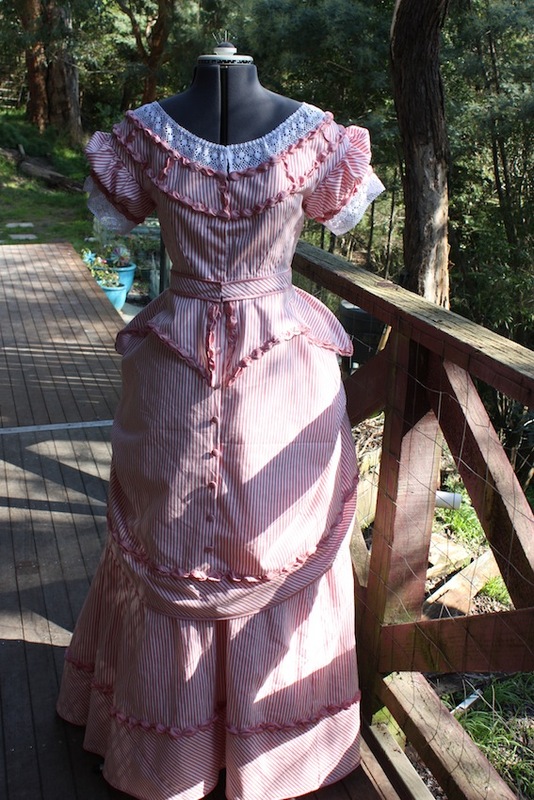 Making a “proper” Victorian bustle gown has been on my list to do for a while. For 15 years actually – ever since I first saw a lady dancing in one and marvelled at its drapery. There were two distinct periods in history where bustles – in their most “Victorian” extreme – were used. The first was in the early 1870’s and the second was in the 1880’s. Elsewhere in history, bumpads of all sorts have been frequently used, but here I am talking about the much more prominent Victorian bottom enhancer. From 1871 to 1873, gowns were remarkably similar. 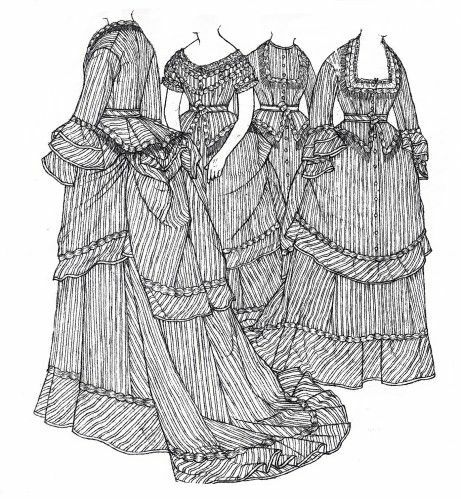 Gown ensembles were most often in two pieces; the skirts and the bodice. The skirts were gored (which made them nice and full) and often included an outer or overskirt that ended around the knees. This overskirt was generally pulled up in a polonaise-style over the bustle behind. For day bodices, the sleeves were not highly gathered around the sleeve head, but instead often flared out at the bottom, sometimes in layers, in a manner very similar to 1970’s pants! For evening bodices, the style was almost off-the-shoulder with short gathered sleeves. The gown that caught my eye more recently was found in one of Janet Arnold’s pattern books, and I even had the material purchased and waiting patiently to be made up! 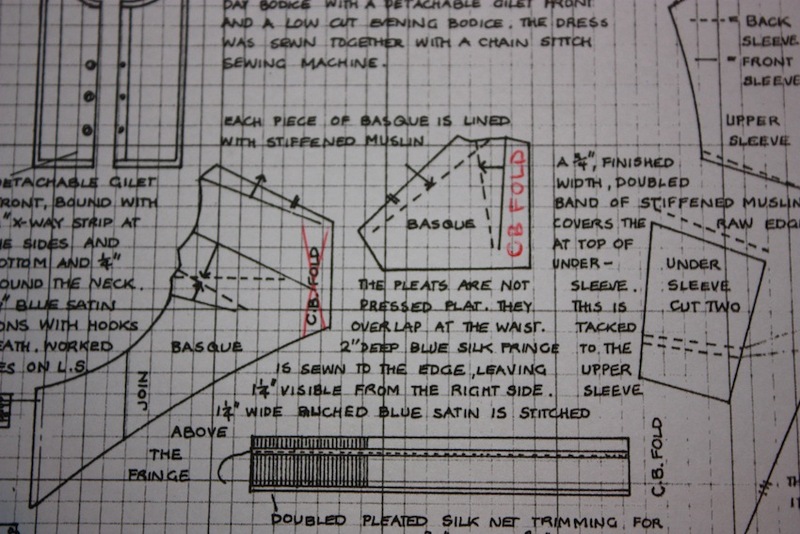 This particular post will deal with making the three skirt layers: the underskirt, the overskirt and the basque. I used the pattern by Janet Arnold, in her book Pattern of Fashions 2. I had to make several alterations to it so it would fit me. 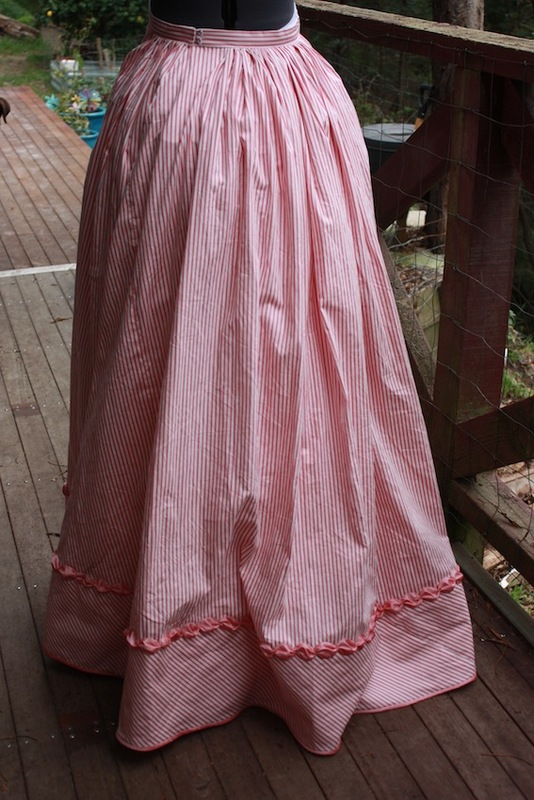 For the skirts, this included increasing the length of the underskirt, and increasing the waistline measurements. The drawing in Janet Arnold’s “Pattern of Fashion 2”. This gown ensemble is made up of a day bodice, an evening bodice, an underskirt, an overskirt, and a basque. I normally post pictures of my pattern pieces, but this gown is quite complicated. If you are interested in making this pattern I suggest you either get Janet Arnold’s book or get a similar historical pattern to use. I dont often bother making a mock-up of the skirts of a gown, so I got straight into sewing! Step One: Sew the underskirt panels together, leaving an opening for the placket, which is on the seam to the left of the centre back. 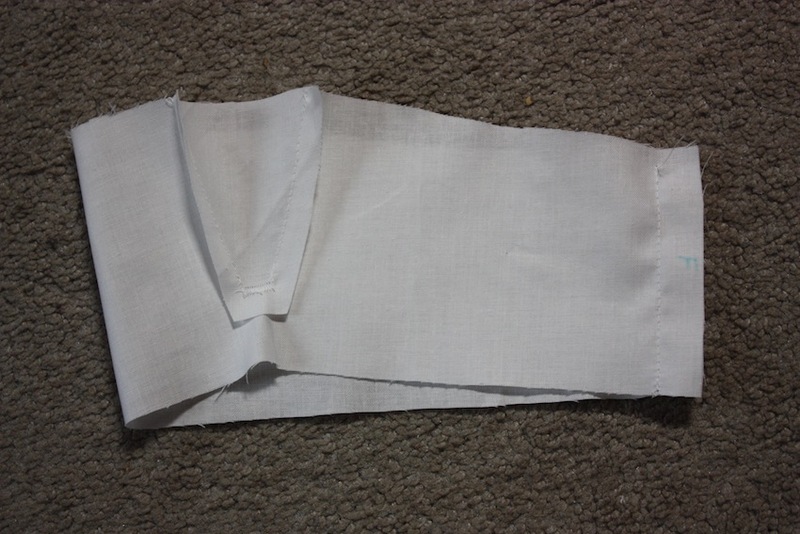 To make the placket, I just pressed the seam allowance open and top stitched around the placket edge. Step Two: Janet Arnold’s pattern includes a pocket in the front left seam of the underskirt. I highly recommend putting one in! 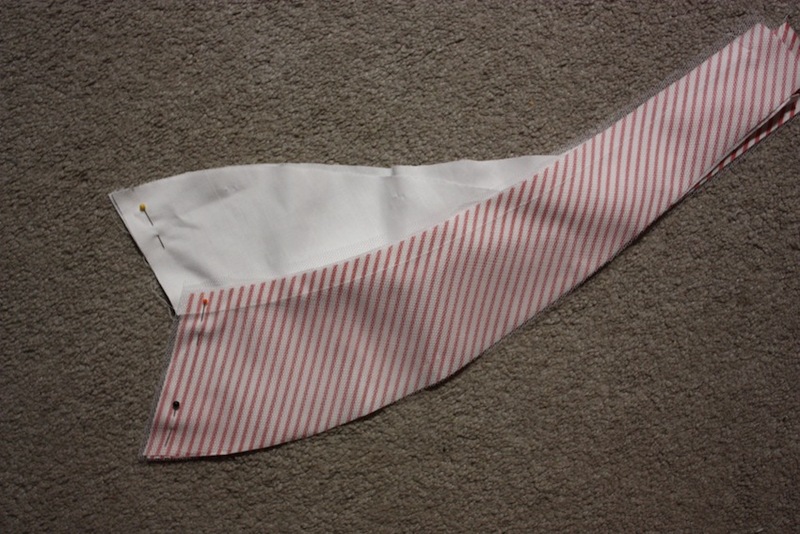 Mine is made from white cotton broadcloth, and set on an angle (facing towards the centre front) in the left seam. Make sure you make an opening big enough to fit your hand in, and that the pocket is big enough to hold your fan or any other item you feel is essential. 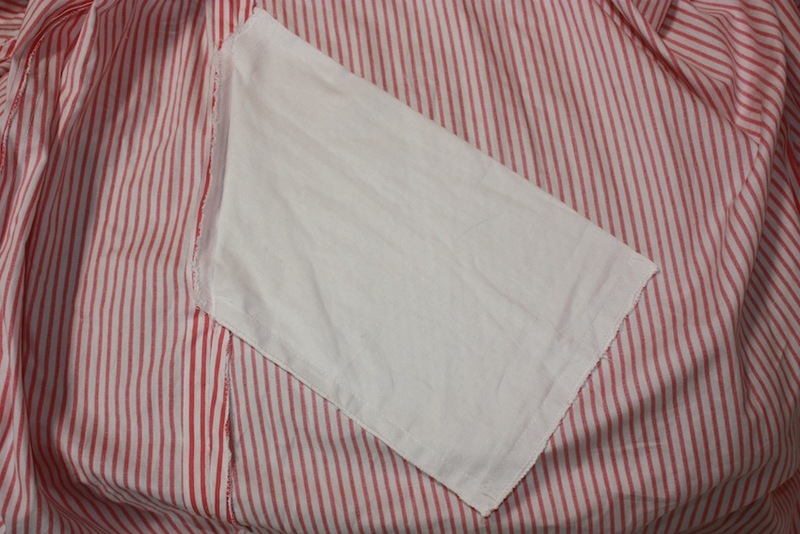 The pocket sewn on an angle in the seam. The top of the pocket opening is positioned 5 inches down from the waistband. Step Three: Laying the two waistband pieces right sides together, sew around them, leaving an opening for to turn it in the right way. Turn it in the right way and press. Sew the opening closed. 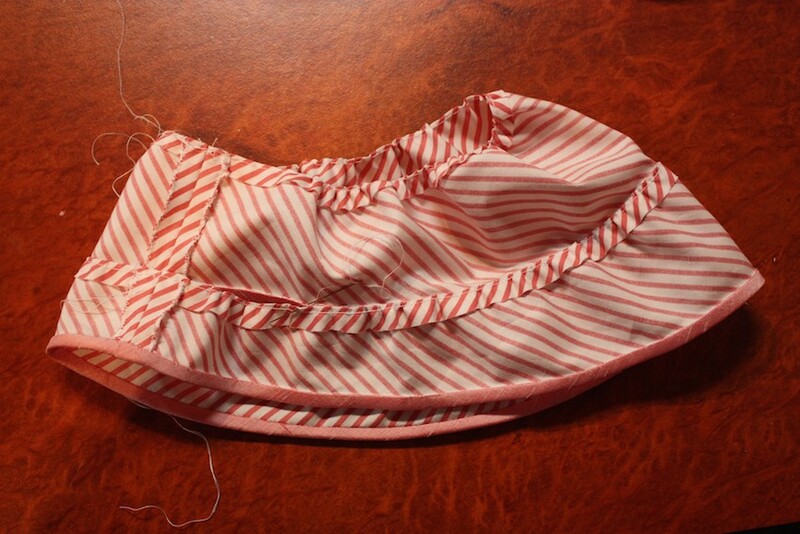 Step Four: Neaten the upper edge of the underskirt, pleat and attach to the waistband. I laid the waistband on top and sewed through all thicknesses. 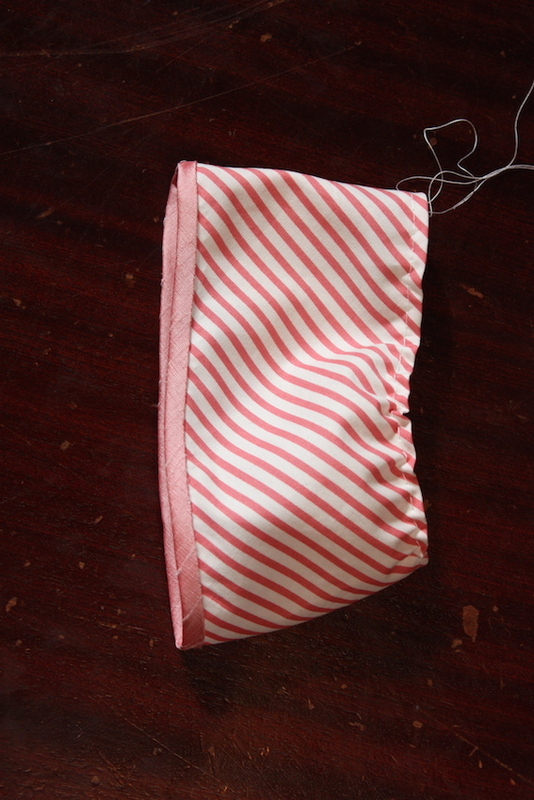 (As compared to the normal method of sewing a waistband.) Attach hooks and eyes to the waistband for fastening. You can see the top stitching on the placket opening, and also the topstitching on the waistband (which secures the pleated skirt). The hooks and eyes are also sewn on. Janet Arnold is not clear exactly how to attach the skirt to the waistband. She does indicate cartridge-pleating was used in the overskirt but does not state that this was also done on the underskirt. 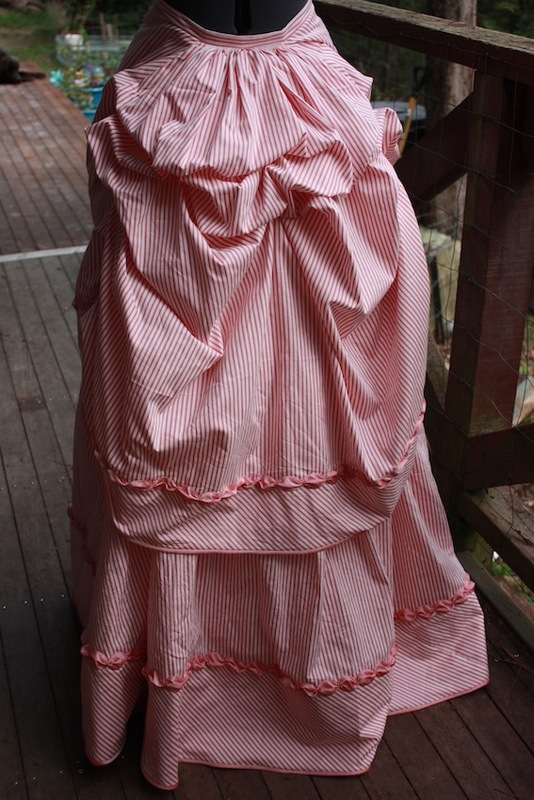 I initially cartridge-pleated the underskirt, but after it all unravelled at the first ball it was worn to, I decided to pleat it the second time around instead! Step Five: Bind the lower edge of the skirt with matching bias binding. I cut my own bias strips and made binding that matched my trim. Step Six: Sew the wide bias strips of flounce onto the bottom of the skirt, folding the raw edge under and sewing through all thicknesses. 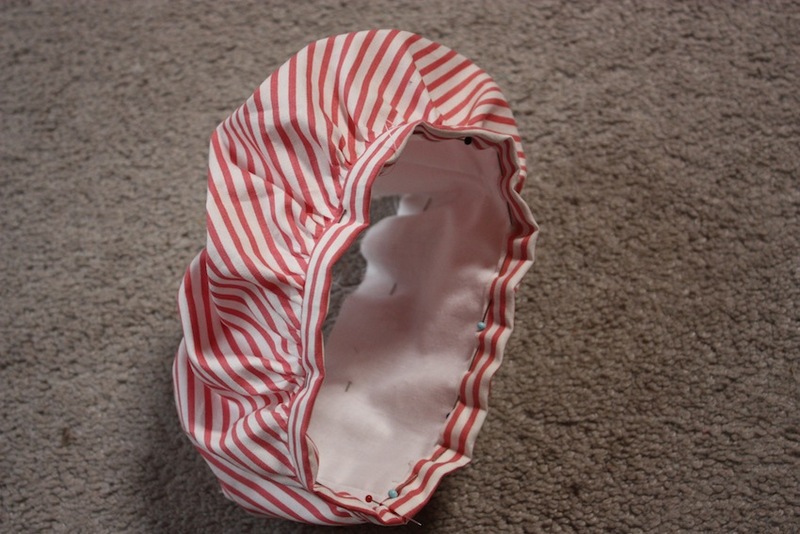 Attach trim to hide the seam. (See below for trim construction.) Sew binding to the bottom edge of the flounce. The flounce has been applied to the underskirt, and the trim hides where it has been sewn. You can also see the two bound edges on the bottom of the skirt. 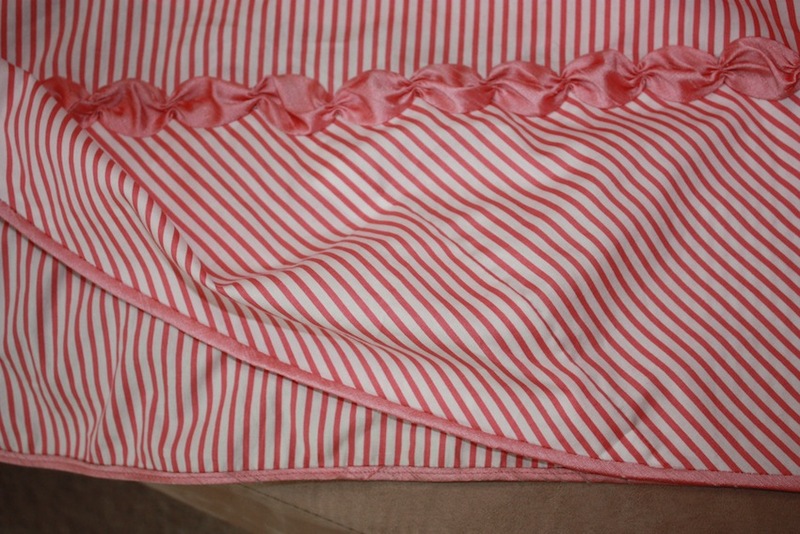 The bottom edge of the flounce does not overhang the skirt, but is the same length as it. 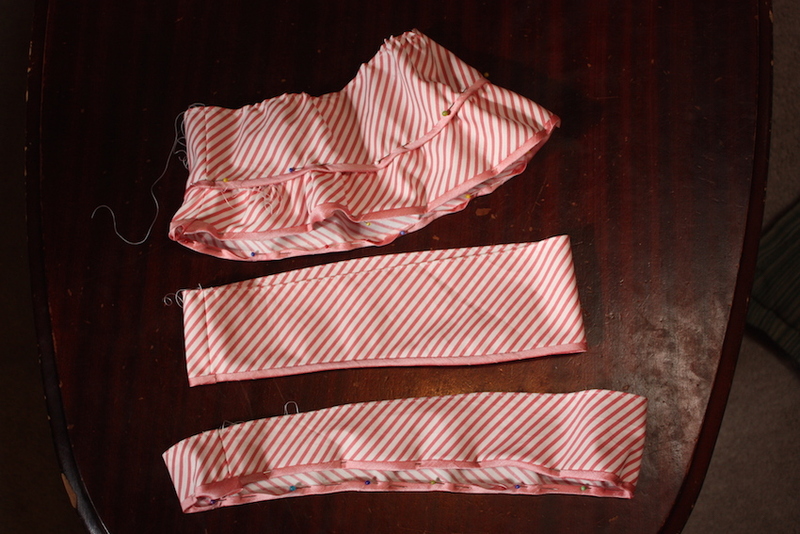 Step One: Sew the skirt panels together, leaving the centre front seam open. Note: On the side seam of the front panel, two upward-pointing pleats are done prior to sewing the side seams. Step Two: Take two waistband pieces and sew them in the same way as I sewed the underskirt waistband. 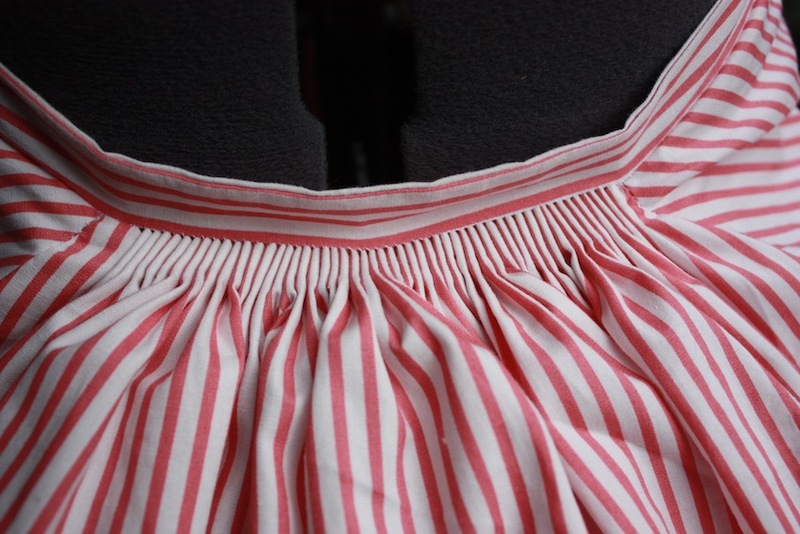 Note: The waistband needs to be a finished piece (no raw edges) when a skirt is to be cartridge pleated to it. This is a different method of attaching the skirt and waistband than is normally done. Step Three: Cartridge-pleat the upper edge of the back panel of the overskirt and attach to the waistband. Attach hooks and eyes to the waistband for fastening. The top edge of the overskirt being cartridge pleated. 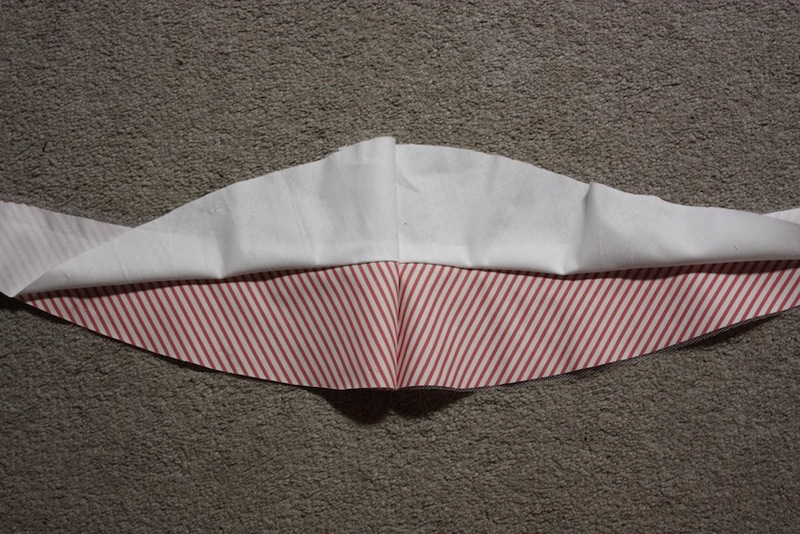 Note that the raw edge is folded over before the cartridge pleating stitches are started. The finished cartridge pleats in the back of the overskirt. Step Four: Right sides together, sew the bias strips of flounce to the bottom edge of the overskirt. Attach trim to cover the seam line. Step Five: Close the centre front seam by using covered buttons. 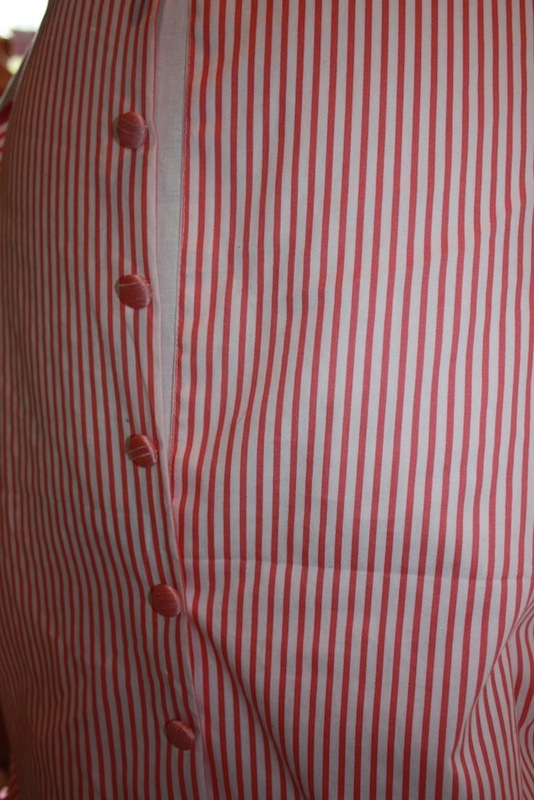 For the bottom four buttons, overlap the two edges (right over left) of the skirt and sew through all thicknesses. For the remainder, sew buttons to the top layer (right) and attach hooks and eyes to fasten beneath the button, hidden from view. All the buttons are false; that is, they do not have corresponding buttonholes. 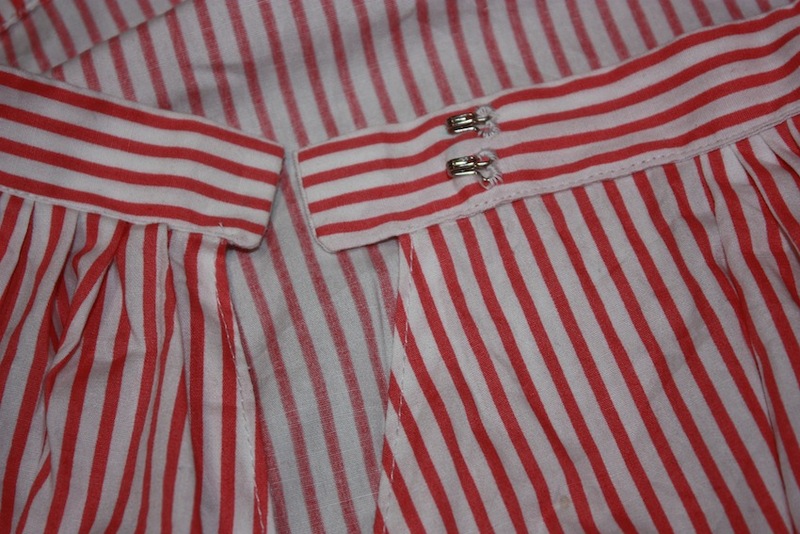 The buttons at the top of the picture are sewn through the right side of the placket and hooks and eyes are hidden beneath (not shown here). 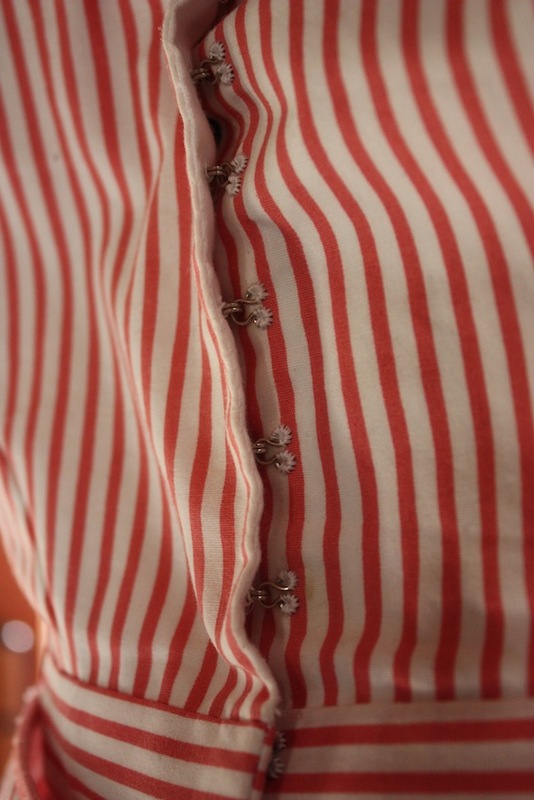 The buttons at the bottom of the picture are sewn through both layers of the placket. 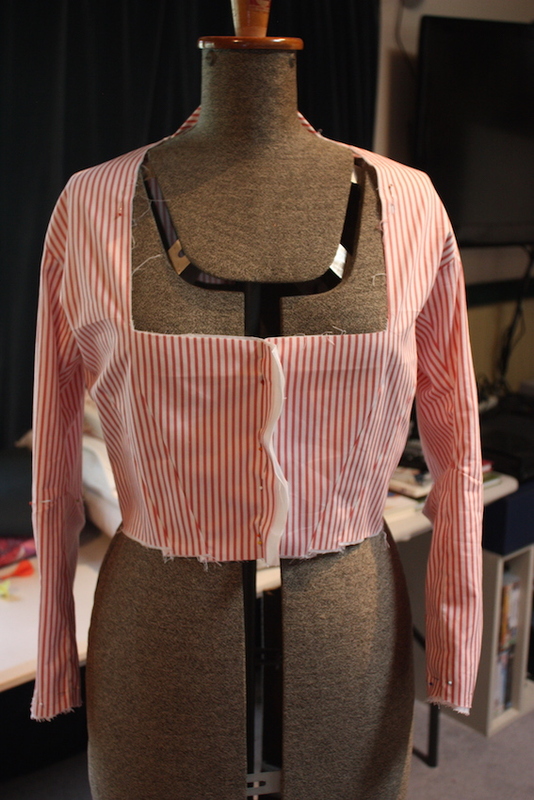 Step Six: The inside of the overskirt is draped using a system of tapes and buttons. The exact placement of these is detailed in Janet Arnold’s pattern, but can otherwise be done by pinning to see what looks best. 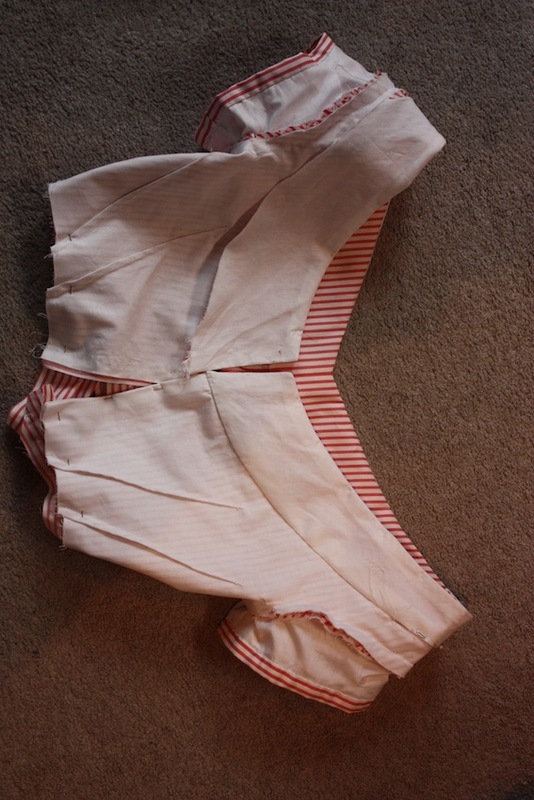 The tapes are sewn to the waistband and have buttonholes sewn into them. The buttons are sewn to the skirt. 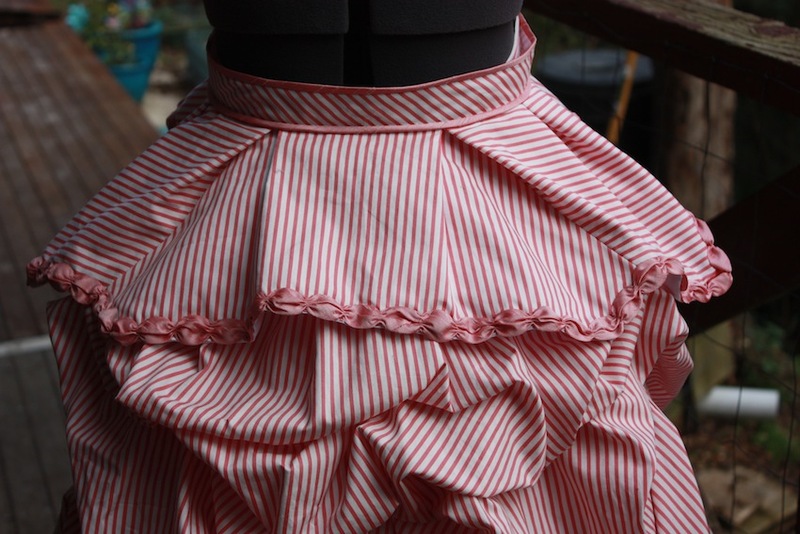 There are two tapes sewn to each of the side seams of the skirt which tie together to keep the skirt sitting at the back. Step One: Sew the pieces of the basque together. Sew the pieces of the basque lining together in the same way. I discovered that there is a mistake in the Janet Arnold book, which confused me for awhile. The CB FOLD instructions are on the wrong pattern piece (the front), but when changed to the other (back) pattern piece, it all makes sense again. The “CB to fold” instruction has been mistakenly put on the wrong pattern piece. Step Two: Right sides together, sew the basque and the lining together along the bottom and centre front edge. Fold the right way and press. Trim can now be added to the bottom edge. Step Three: Make the pleats in the waistline and bind the top edge with bias binding to hold the pleats. Janet Arnold’s example was not bound with bias binding, but I found it easier to do that to properly hold the pleats in place. You could also attach it to the waistband in the normal manner instead. The basque, with the trim attached and the waistline bound with bias binding, ready to attach to the waistband. Step Four: The waistband is made up of two main pieces: the outer layer cut on the bias, and the lining on the straight grain. The two layers can be laid wrong sides together and bias binding sewn around the top and bottom edges. The raw edges on the two short sides of the waistband can be turned to the inside and sewn down. Step Four: Hand sew the bound upper edge of the basque to the waistband. I stitched “in the ditch” between the waistband binding and the outer material, through all thicknesses. Add hooks and eyes to fasten. The front view. The bound waistband meets edge to edge. 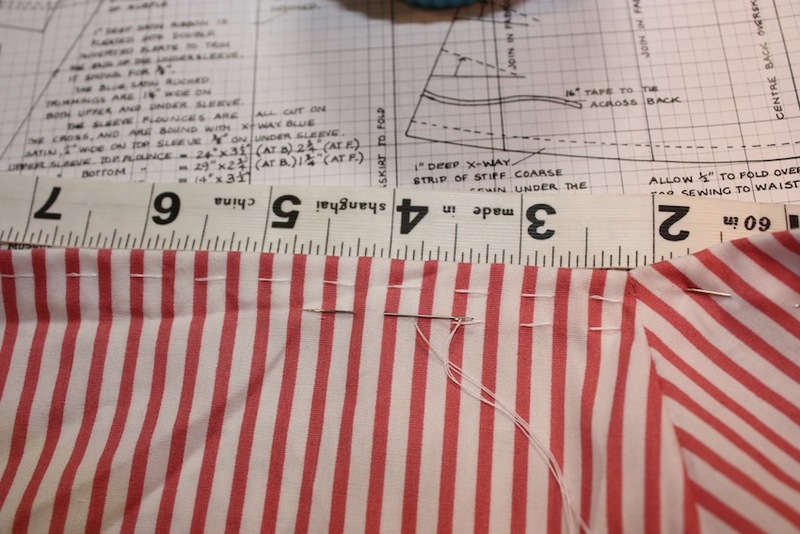 Step One: Cut bias strips from your chosen material, joining the strips until you have the necessary length. Fold the raw edges in on the wrong side and press. You piece should now look similar to bias-binding that can be bought in the store. 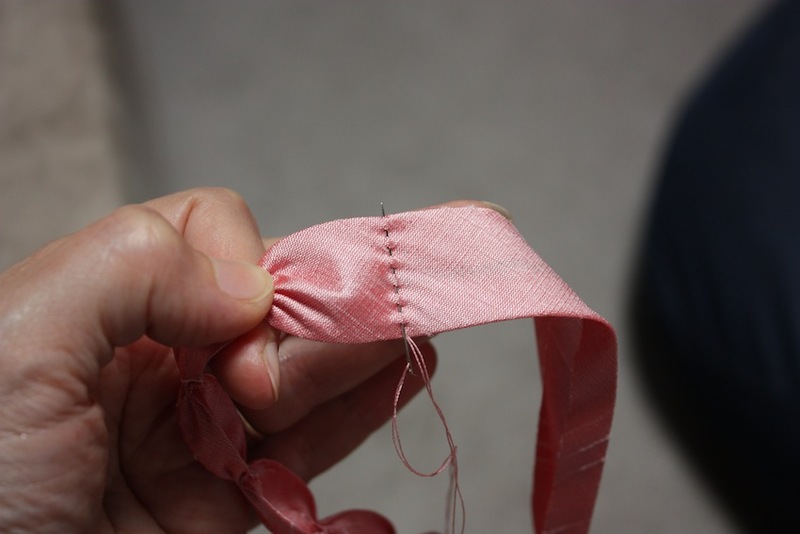 Anchor your thread with a few stitches to one folded edge of the strip. Use a few stitches to anchor the thread at one side of the trim. Step Two: Using a running stitch, weave your needle in and out of the material until you have reached the other folded edge of the strip. 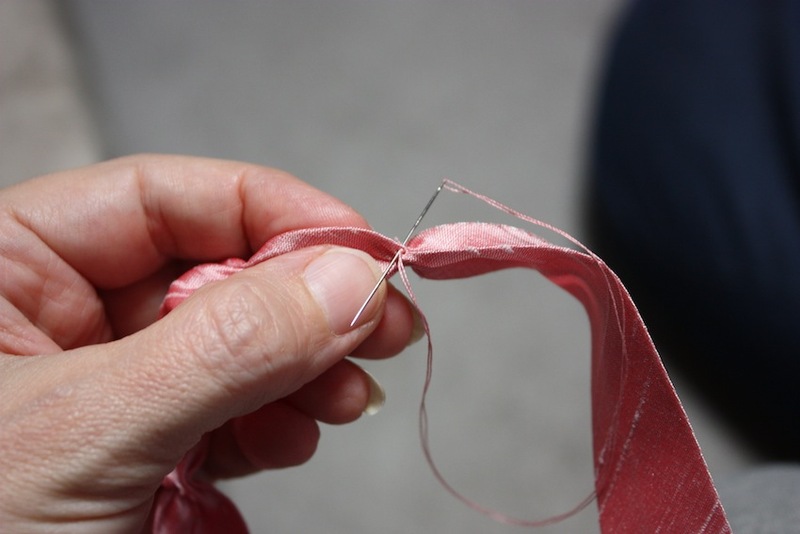 Don’t pull your needle out, as it makes it more difficult to gather the threads in the next step. 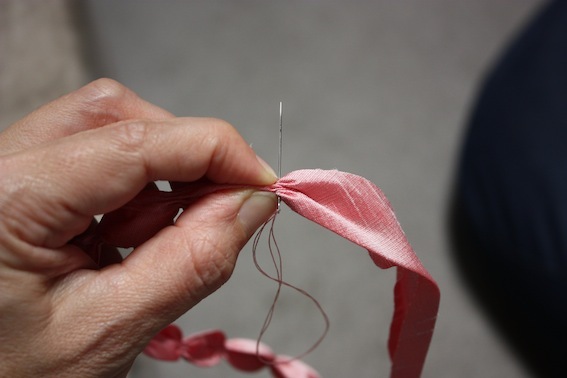 Weave the needle in and out across the strip, creating a running stitch. Step Three: Use your fingers to squeeze the material together whilst it is still attached to the needle, creating a series of gathers. Squeeze the material together whilst it is still attached to the needle. Step Four: Pull the needle through the material, still holding the material tight in its gathers. 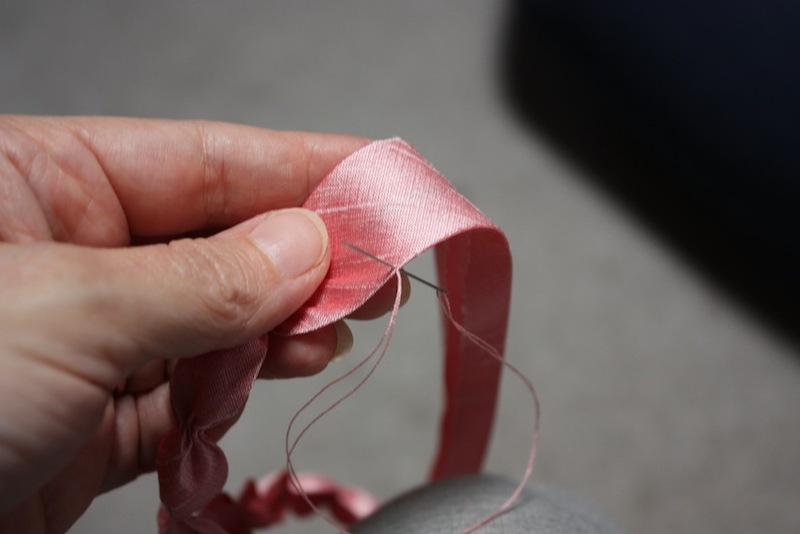 Make a few small stitches on the other folded edge to anchor the thread. Anchor the thread by stitching a few more stitches on the other folded edge. Step Five: Hand sew the trim onto your gown, trying to make your stitches as invisible as possible. I hand sewed the top edge and the bottom edge of the trim to the gown, rather than just securing it at the gathers. That then ensures the raw edges are all anchored securely. And here is the skirts all layered together. My dressmakers form doesn’t seem to hold the bustle in the right place on the waist, so the back does tend to droop. However, it doesn’t do that when I am wearing it. 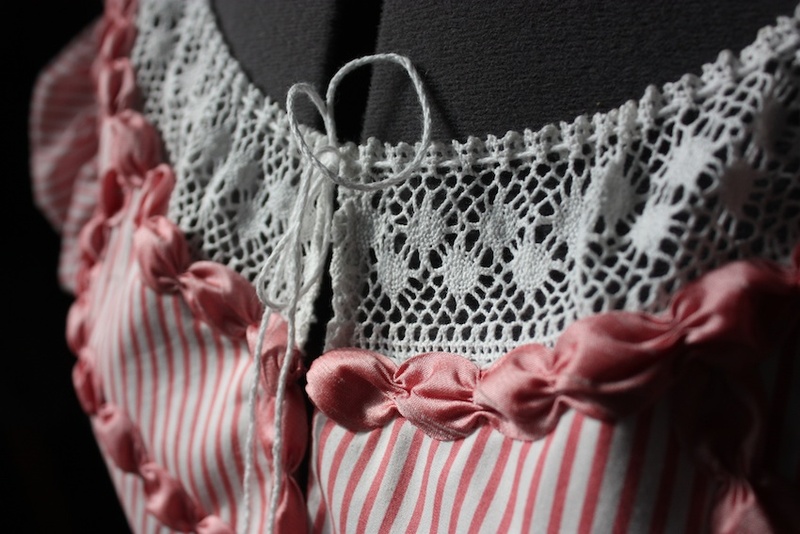 Keep an eye out for the next post in this series, the evening bodice. Have I told you before how much I love going to the Jane Austen Festival? 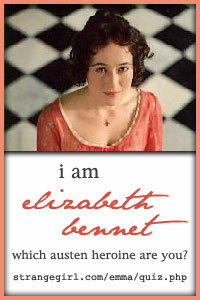 It is not so much that it is about Jane Austen or even that it is set in the Regency period. It is not about a fantasy for Mr Darcy either. For me it is about having an opportunity to dress in historical costume. And it is about learning new things about history, like the dress, the events, the accessories, and the entertainments of the time period. And – of course – I do love dancing and spending time catching up with the friends I’ve made at these events. 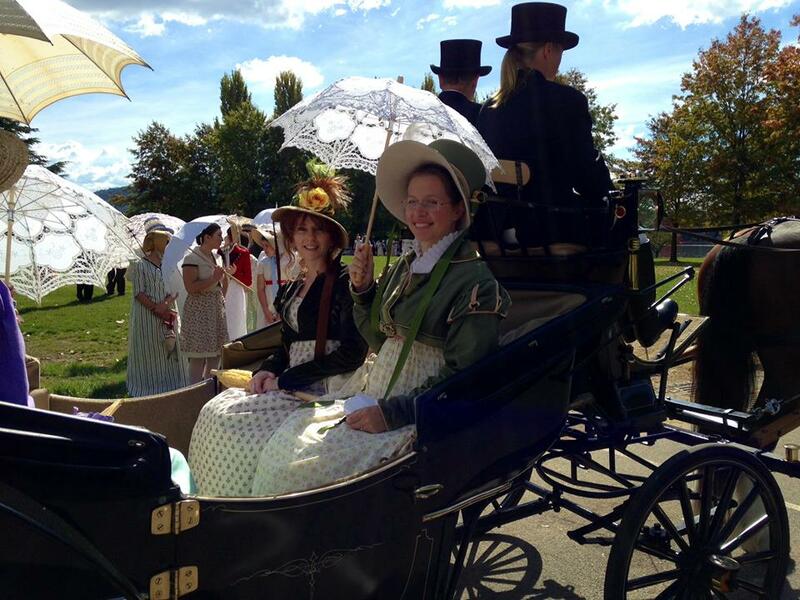 In addition, there is not a whole lot of opportunities in my area to participate in period costume events, which makes the Jane Austen Festival in Canberra all the more alluring. This year’s festival was aimed at celebrating the 200th anniversary of The Battle of Waterloo and the fall of Napoleon in 1815. My caraco jacket and stomacher worn for the Georgian pleasure evening. Our festival weekend began with participation in a wide variety of workshops, from dancing to sewing and historical talks on the era. 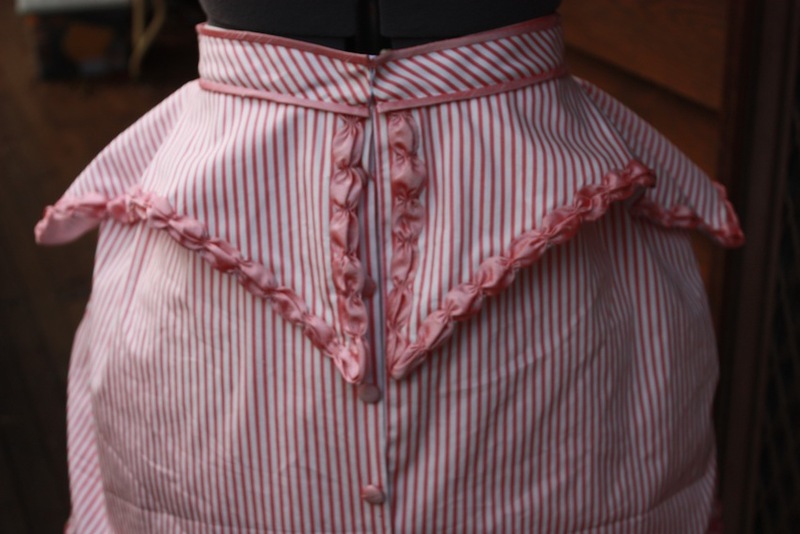 The sewing options ranged from making an 1820’s pelerine to making a 1806 bonnet, and there were other demonstrations like how to tie a cravat and discussions on putting the finishing touches on your costume. 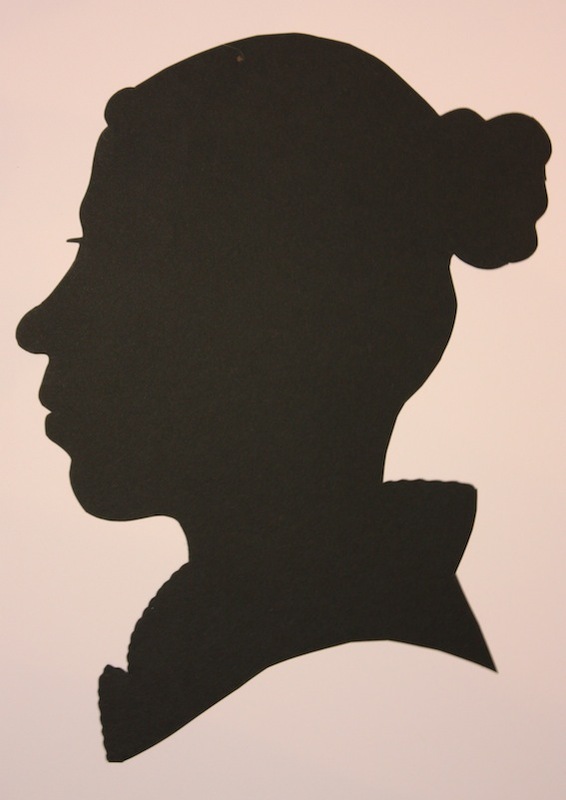 The history symposium focused on “Austen’s Men”, with presenters not only talking about the men depicted in Austen’s novels, but also the men she interacted with daily, her brothers. I taught a workshop on making a fichu in the morning, and then spent the afternoon learning to dance some large dances involving 12 to 16 people. Next on the dancing menu was the minuet and the “knotty allemande”, which was mentioned in the 2000 movie, Sense and Sensibility. Interestingly, Emma Thompson (as Elinor Dashwood) dances one of the elements of an allemande (that “peeking-in-the-window” move) in this scene with Robert Ferrars. My attempt at Georgian hair. It is very difficult to do yourself, and takes a degree of practise! I did several hair “trials” in the few weeks leading up to the event. 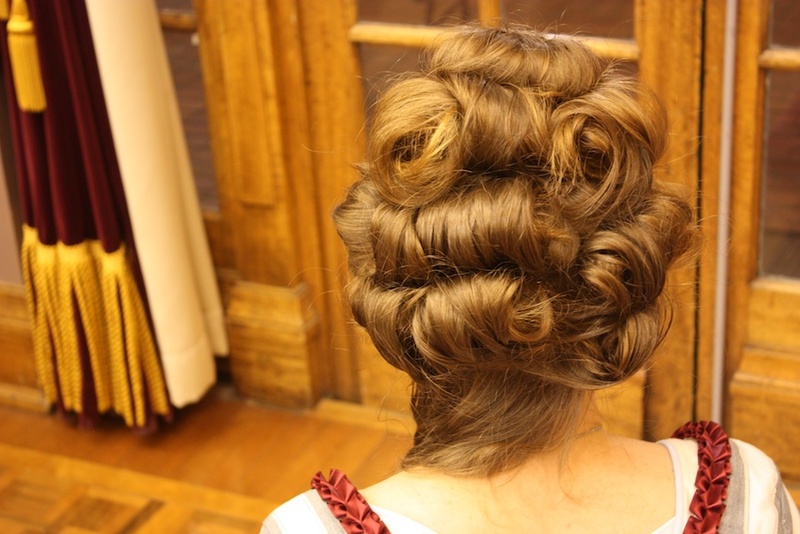 After spending an hour in the evening doing my hair in an 18th century style (luckily it didn’t fall out! ), we arrived at the Georgian Pleasure Evening on Friday night. 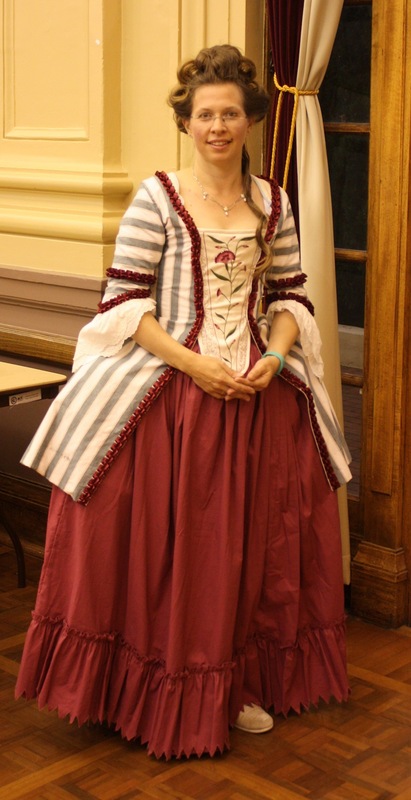 I wore my caraco jacket and petticoat with the matching embroidered stomacher I made a few years ago. It was a lovely evening intermixed with dancing, singing, Neoclassical ballet performances, card playing and baroque display dances. The second day of the festival involved another comprehensive day of workshops and talks, with the history symposium focusing of The Battle of Waterloo. 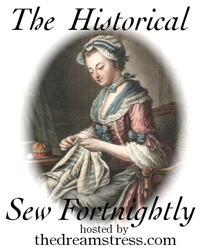 The sewing workshops included – among other things – making a knitted miser’s purse, how to scale patterns, and a very popular Period Pattern Review discussion that explored a great number of period patterns and their strengths and weaknesses. I spent the morning again teaching a workshop, this time on whitework embroidery, including both pulled work stitches and normal embroidery stitches. I then had the opportunity to learn English paper-piecing, which is a patchwork technique used by Jane and Cassandra Austen to make their quilt, currently on display at Chawton Cottage. 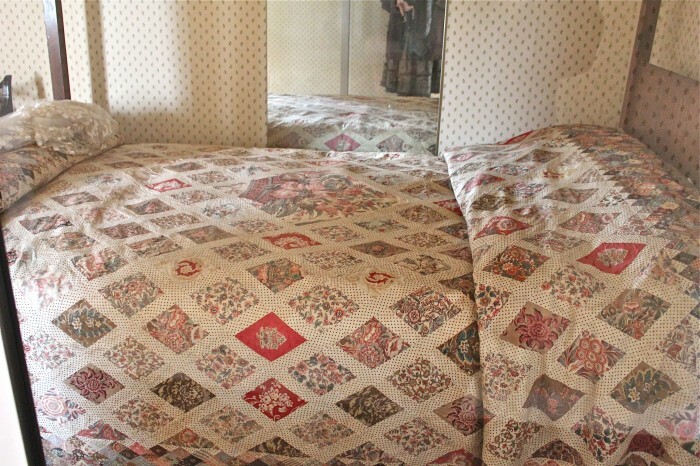 Jane Austen’s quilt, on display at Chawton Cottage. The presenter, Marilyn Steven, brought along her reproduction of the Austen quilt and shared her journey on how she made it, which was fascinating to hear. 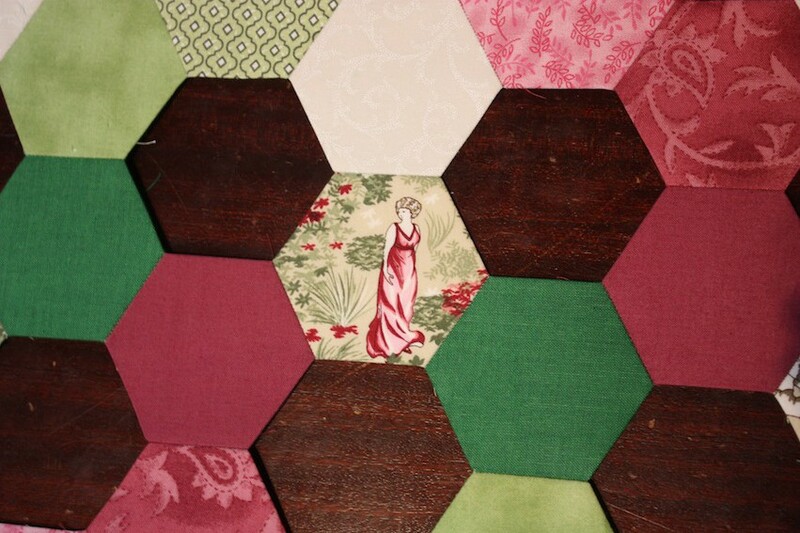 Since arriving home I have made some great progress on a table runner using hexagons with the paper-piecing technique. This is my attempt at paper-piecing, so far. The remainder of my afternoon was spent dancing; the Mescolanze, the Mazurka, the Waltz and the Polonaise. One particular favourite was learning to dance the Lendler, most popularly seen in the movie Sound of Music, though our version differed a bit from the movie version shown here. I found the Lendler particularly tricky at about the part where she (Julie Andrews) started blushing. It was quite easy to get yourself and your partner all tangled in knots! 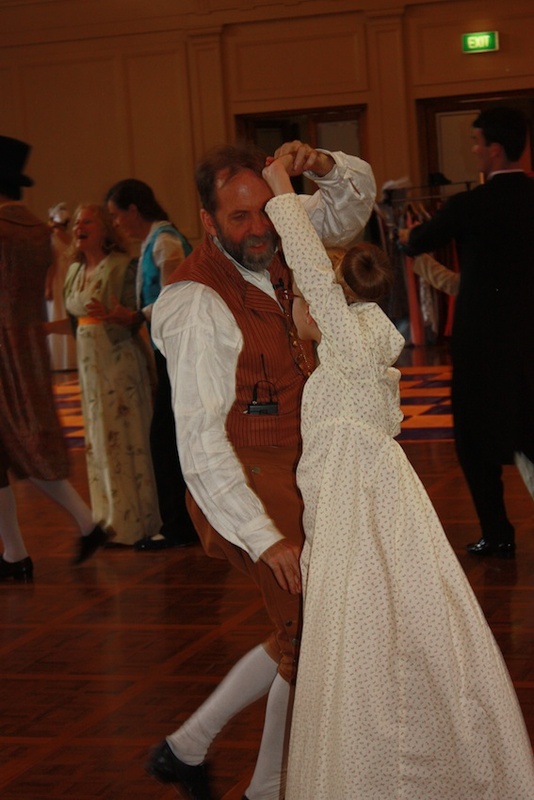 The picture to the left is of my daughter dancing the Lendler with the dance instructor, John Gardiner-Garden. 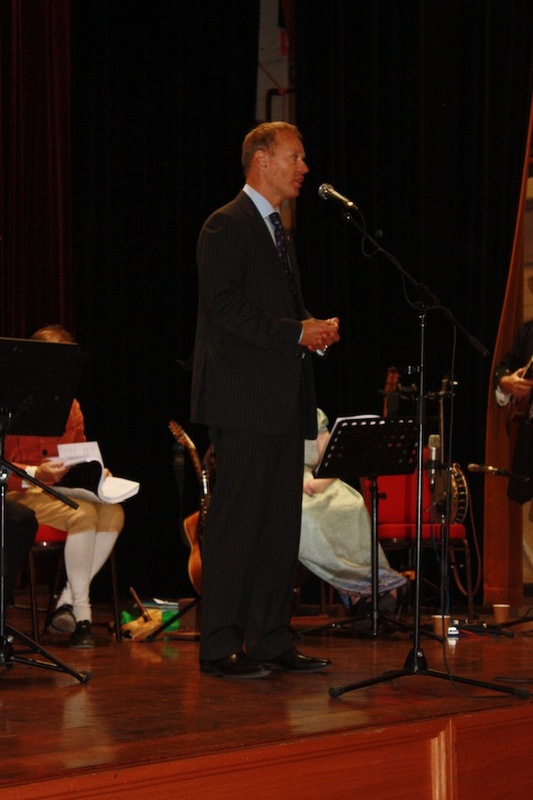 The Belgium ambassador to Australia, H.E. Mr. Jean-Luc Bodson. We had the pleasure of welcoming the Belgium ambassador for the evening, who talked briefly about the impact that the Battle of Waterloo had on Belgium. When he is not living in Canberra, Australia, he lives at Waterloo, which is located in the middle of Belgium. He related how the Belgian people fought on both sides of the conflict and how important it was that Napoleon be defeated. One of the highlights of the evening was the first-ever dance through of “The Battle of Waterloo Dance”, cleverly depicting ranks of soldiers coming forward to engage in battle. With 96 dancers on the floor in one large set, it was quite a feat – not incomparable to the battle itself! The morning was spent at a local theatre seeing a production of “Mr Bennet’s Bride”, a prequel to Pride and Prejudice, which explored how Mr Bennet came to choose Mrs Bennet as his wife. It was a superbly performed period theatre experience and I thoroughly enjoyed it. I don’t get many opportunities to visit the theatre, so it was a real treat. Afterwards one of the directors came over to me and congratulated me on my costume. He said that the Costume Director had been looking at all the audience members’ costumes and thought that mine was especially worthy of comment. I thought that was a lovely compliment! The afternoon weather was perfect for the promenade from Albert Hall to the Lennox Gardens in Canberra. A leisurely parasol-filled picnic and carriage ride followed. The festival concluded with the late afternoon Cotillion Ball, where I managed to dance my favourite dance, The Downfall of Paris, before leaving for the long drive home. This event has become an annual tradition for me, (its just my cup of tea really!) and I am hoping to take some more of my children next year. Stay tuned for some forthcoming posts on costumes for children in the coming year! We are also planning some Regency events for next year in Melbourne, Australia. You can check out The Melbourne Regency Picnic on Facebook for our up-and-coming event on March 6th, 2016 at Elsternwick.